Kevin Hancock, President of Hancock Lumber Company, will share his experiences with his diagnosis of spasmodic dysphonia and how it changed his management style and his approach to life. After graduating from Bowdoin College with a degree in American history, he taught and coached basketball at a postgraduate prep school. When his father became ill in 1991, Kevin went to work at one of the company's stores. When his father died in 1997, Kevin, then 32 became the company president. Established in 1848, Hancock Lumber operates ten retail stores and three sawmills, with 640 employees. The company grows trees on 12,000 acres of timberland in Southern Maine. Hancock Lumber is a multi-year winner of the “Best Places to work in Maine” award, a past recipient of the Maine Family Business of the Year award, and the Governor's Award for Business Excellence. Also the MITC, "Exporter of the Year” Award. 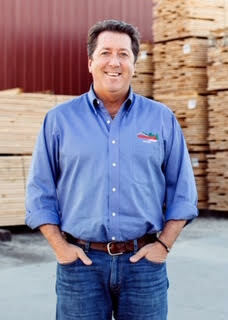 Hancock is past chairman of of the National Lumber and Building Materials Association as well as the Bridgton Academy Board of Trustees. He is a recipient of the Ed Muskie Access to Justice Award, and Habitat for Humanity's Spirit of Humanity Award, as well as others. In 2012, Hancock read about the severe housing shortage at Pine Ridge, an Oglala Lakota Sioux Reservation in South Dakota. His historical interest led him to visit often and he became a passionate student of the economic and social challenges faced by the Pine Ridge residents. Hancock will discuss his book based on these experiences, published in 2015, Not for Sale: Finding Center in the Land of Crazy Horse. Hancock remains an advocate of strengthening the voices of all individuals- within a company or a community such as Pine Ridge - through listening, empowering and shared leadership. Copies of his book will be available for sale for $20.00 at the luncheon. The cost of the luncheon is $8.00 pp by RESERVATION ONLY and must be made by noon on Wednesday, March 6, 2019. Senior College reservation line is 753-6510 and follow the prompts. Those without a reservation can purchase a lunch at Café LA on campus and are welcome to listen to the speaker for free. Doors open at 11:30 a.m. for lunch and the program is from 12 noon to 1:00 p.m. Please note that there may be rare occations that we may have to change the program on the scheduled day.